European market leader, Aparthotels Adagio®, has announced the launch of a second UK property in Birmingham’s City Centre, opening on 10th August 2015. The newly constructed 4* Adagio Birmingham City Centre aparthotel provides roundthe-clock serviced accommodation, with staff on hand 24/7, combined with the flexibility and independence of 108 modern apartments. 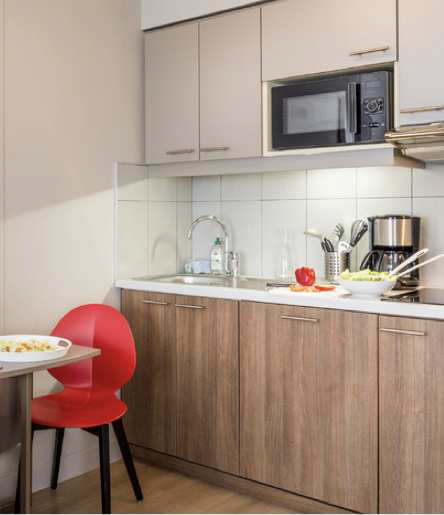 The newly furnished apartments range from two person studios through to one-bedroom apartments, each boasting a fully equipped kitchen providing full self-catering amenities. Guests can also enjoy the benefits of a range of top hospitality services including free high speed Wi-Fi, a breakfast buffet and even a laundry facility including a dry cleaning service. All Adagio aparthotels offer competitive scaling rates with reduced prices from the fourth night, therefore the longer guests stay the less they pay. The prime central position is an ideal base for business travellers offering a close walking distance to the city’s business district, Colmore Row as well as New Street Station which has excellent connections to BHX airport. It is also ideal for tourists who wish to visit the nearby Bullring Shopping Centre and the vast array of restaurants, theatres, bars and cinemas. For those looking to explore the rich history and culture of the city, the nearby grade 1 listed St Paul’s Cathedral offers a divine break from the city bustle with stunning stained glass windows and Georgian architecture. Europe and is quickly expanding across the UK following the sucessful opening of Liverpool City Center in 2013. Further developments are planned for Edinburgh and London in 2016 and beyond. Aparthotels Adagio® are primarily aimed at mid and long-stay visitors providing attractive tiered pricing from the fourth night onwards. Vangelis Porikis, Adagio Director Central & Northern Europe, said: “The UK continues to be a key market for growth and we are delighted to open our second property in the UK’s second city, Birmingham. This will be followed by the highly anticipated openings in London and Edinburgh next year, the success of Adagio’s growth is testament to our ability to innovate in hospitality and bring new ideas and services to guests.